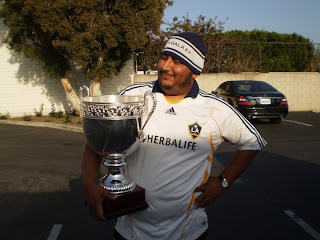 The Road To The First Kick Rally has made two stops already -- Orange County and the Inland Empire -- and they've been terrific so far. 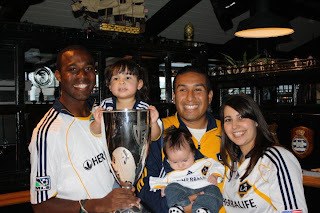 Lots of fans have showed up to take their picture with the 2009 MLS Western Conference, and 2009 SuperClasico Cup, and with either Yohance Marshall and Bryan Jordan or members of our Miss LA Galaxy Court (see photos below). 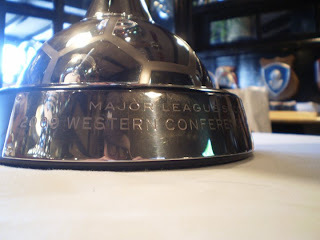 Tonight, the Cups will make on final stop before tomorrow's pre-game rally at the Off-Campus Pub. 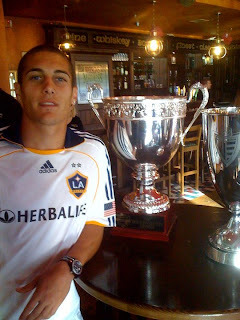 If you want to join us in the festivities, come by the Ye Olde Kings Head from 6 p.m. to 8 p.m. Like we said, the Cups will be there, as will Miss LA Galaxy. For now, enjoyed this behind scenes video of Nicola and Liz from yesterday's interview at KRCA 62 and photos from the last two days.